Brown trout, found in every trout stream and river throughout the British Isles, are the perfect quarry for the flyfisher. They vary enormously in both size and appearance according to the type of water they inhabit — from the great, deep, bronze and often lightly marked aldermen of the Test and Itchen occasionally weighing three or four pounds or even more, through the bright light golden, black and vermilion spotted three quarter pounders of the Exe and the Eden, to the fierce, dark and slender three- or lour-ounce fish of the Deveron and the Upper Bann. 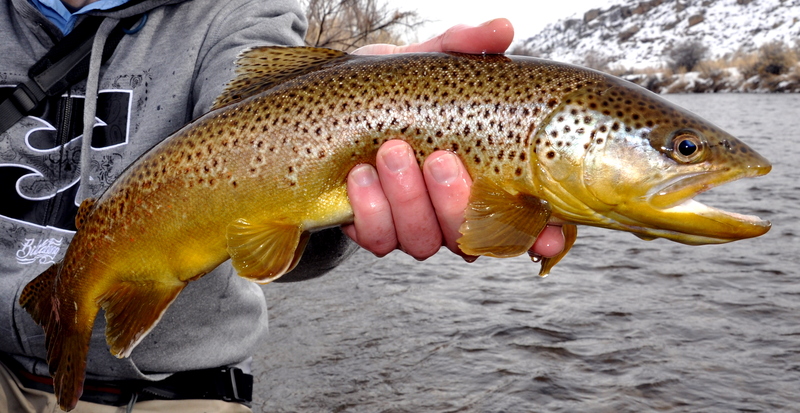 Brown trout spawn in the winter, between the beginning of December and mid- to late February. In order to do so, they move into stretches of river with clean gravel beds through which the water can percolate, washing the eggs. These areas, known as redds, are often upstream of the trouts’ spring, summer and autumn haunts. On a redd, a hen fish cuts a hollow in the gravel with sweeps of her tail and then lays some of the several hundred ova she is carrying into it. Simultaneously, her mate, holding position beside and usually very slightly ahead of her, discharges a stream of milt into the current, some of it leaching and fertilizing the ova. The hen fish then moves a foot or so upstream and cuts another hollow, the pebbles washed out of it covering the fertilized ova in the previous one and thus protecting them. Mating, although not usually fatal, is a debilitating process for trout, and they may need as much as two or three months to regain condition, which is why the trout season is generally closed from the end of October until the middle of April (although the opening date is extremely variable, ranging from the middle of January on some Scottish rivers to the beginning of May on one or two chalk streams). Especially in rivers sparse in food, a few of the older fish may be unable to compete with the younger ones and fail altogether to put back weight lost in spawning. Such trout, readily identifiable by their gauntness, even when caught in June or July, are best compassionately dispatched, although they will be unfit for all but the least fastidious of tastes. After about four to twelve weeks in the redds (depending on the water temperature), the trout’s ova hatch into alevins, strange, almost tadpole-like creatures which continue to live for some time on yolk sacs hanging from their throats. As the yolk sacs become depleted, the alevins become increasingly fish-like and are soon clearly identifiable as trout fry. The fry live in shoals in slack water, usually close to the shore, and feed on the minute invertebrates they find there. They, in turn, provide easy pickings for a whole range of predators and the mortality rate from the oval stage until the young trout are big enough to be reasonably safe is staggeringly high. Even when fully grown, trout continue to be preyed upon by herons, otters, mink and pike, although there is some evidence to suggest that when less agile coarse fish are present the major predators (man excluded) will take them in preference to the trout. In ideal conditions, brown trout may live for anything from eight to twelve years, becoming sexually mature in their fourth year. They are essentially individualistic, adopting lies which provide them with refuge from the full force of the stream and cover from predators and strong direct sunlight, but where they can still take full advantage of the conveyor belt of food borne down to them on the current. Brown trout do not normally move far from their lies to intercept food, rarely more than about three feet. Each one has its own identified bolt-hole, usually quite close to its lie, into which it will slip if it believes danger to threaten. 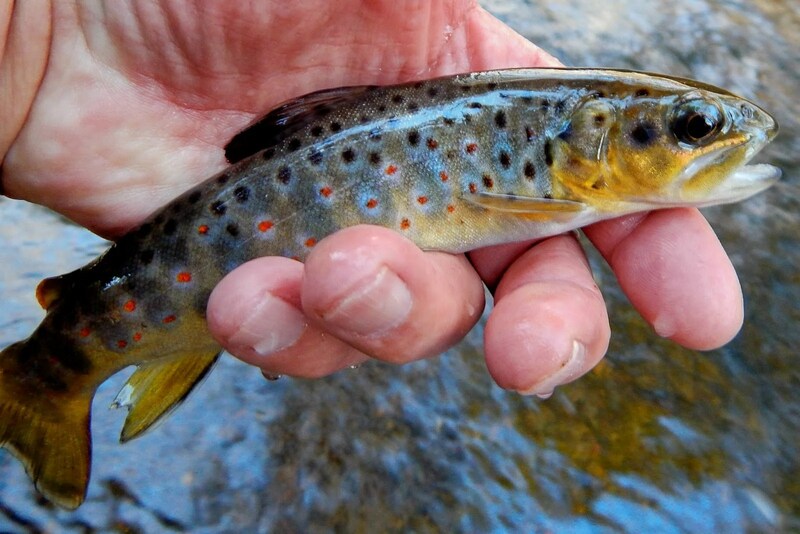 There is a clearly established pecking order amongst brown trout in streams and rivers, the biggest and fittest fish almost always occupying the best lies. And, when a fish is caught or otherwise evicted from his lie, it is remarkable how often it will quickly be taken over by another trout.